Buy the Bosnia and Herzegovina Table Flag table flag. The Bosnian table flags are ideal to be placed on the desk, to remember a trip or to welcome someone who visits us coming from Bosnia and Herzegovina Table Flag. The Deskotp flag of Bosnia and Herzegovina Table Flag is sold individually without a stand. Stands can be purchased separately. 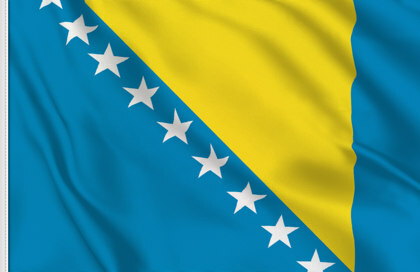 Price Alert "Bosnia and Herzegovina Table Flag"?